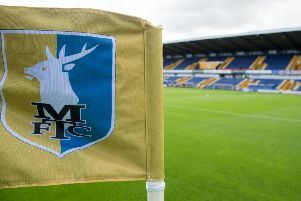 Mansfield Town v Bury. 'Tyler Walker looks for a penalty decision in the second half. Mansfield Town crashed out of the Checkatrade Trophy after a poor display and a 1-0 home defeat by Bury in tonight’s second round clash at the One Call Stadium. Dominic Telford’s 35th minute finish proved enough for the Shakers after they dominated the first half and they were value for their win. Stags were improved after three substitutions at the break but could not find a way through the visitors, who also had former Stags midfielder Stephen Dawson sent off five minutes from time for his late challenge on Tyler Walker.